Our meeting started right at 7 PM All members of the Board were present in front of a good crowd. - Lake meetings have begun with lake erosion companies. - Book lending library is open and ready for books. Right now the library is open in the clubhouse when the PM is in the office. We are accepting books for all ages. - Clubhouse will receive new roof starting on May 1st . We moved $ 480,000 from cash into two CDs. We have worked with C&S to make sure that all of our accounts are under the FDIC limits. The CDs will bring a fair interest. - Paint colors for homes were discussed. Residents can pick colors from the existing books that are in the Clubhouse. Any other color not in the books will have to be approved by a majority of the Board. - Colors were picked for all homes including the homes that have oil stains to be painted. The Board picked the paint and the color. An ARC proposal has to be presented to the ARC committee for approval. We found that some driveways have been so stained over the past 20 years that power washing no longer works. - The residents that trimmed a tree to a 20' stump will be asked in writing to remove the remains. Several projects coming up for SH/SK. ​Starting on April 29th the roof on the clubhouse will be replaced. We are using money from the reserves for this project. Florida Southern won the bid. In May the next three buildings in SK have their roofs replaced. We postponed the job from March so that we could get the same supervisor, William, from Florida Southern. This project I am pleased to say will all come from reserves. Once all 22 buildings are done ( seven to go after these three) all monies will have come from Reserves. The total project cost will be close to $800,000. Sometime after school ends we will be replacing the parking lot in front of the clubhouse. Everything will be replaced including the curbing stops for the cars. The lot will be relined and will look great. This money is also coming from reserves. The 45th Street project will be finished in or before July. The Board pressed them on replacing all sidewalks along 45th St and they have agreed. Once done a committee will work to re-plant both front entrances including the lawn in front of both entrances. Finally Twin Palms takes over the landscaping contract on 5/1 go SH and SK. They are currently handling our irrigation, fertilization and lawn replacement. A lot is going on. Your Board cares. Jbn. Residents of Sabal Key and Sabal Harbour are reminded that 45th St E will be closed from SR 70 to Pro AM Dr. this coming Monday evening and every evening through Friday from 9PM to 5AM. Detour signs will be placed on SR 70 and 37th street. ​I hate to be the bearer of bad news but the first water sample failed and hopefully they will give us the okay tomorrow Saturday … I will stay in touch with Gator on this … Sorry for the bad news … this effects all streets and all of SK. Please continue to boil your water until I get word that all is okay. Please add Abacos to the streets where the water will be turned off tonight at 10 PM. Please store water and any tap water tomorrow will have to be boiled until the large white signs are taken down. The SHHA Annual Board meeting was well attended and the Board will continue with the same Board Members with John Nesbitt, President, Bill Leggett, Vice President, George Martin, Treasurer, Jeff Midkiff, Tim Birkey, Valerie Knoll and Glenna Leard. Twin Palms will be signed on as our new landscaping company effective 5/1/19 for both SH and SK. They are currently our irrigation company and have done major plantings throughout SK and SH. Florida Southern was approved to re-roof the clubhouse. Three bids were received. FS bid was for $ 12,725. Money will be taken from the Clubhouse roof reserve that has $ 14,800 in it. Terry's Trees proposal to trim 19 oaks and remove on dead oak across the lake on the 4400 block of Useppa. This work will be done next week. The pool will be closed 3/14-15 due to the fact that it will be heavily shocked. Southern Manatee Fire Rescue @ Block party Our local fire Firefighters from station 4, Southern manatee Fire Rescue will be at the block party at 4 pm!! They will show the kids their truck and talk fire safety!! This will be a great addition to our block party for the kids and kids at heart!! SAVE THE DATE 3/9/19 THIS SATURDAY Starting at 4 PM the Social Committee for SH and SK will have their first annual Community Block party. There will be games and Food. A food truck will arrive around 5 PM. Remember not to bring any bottles to the party due to the rules of the pool. Please read the attached file. ​Either today or tomorrow all owners in Sabal Harbour and Sabal Key will be receiving information for the March 12th Annual meeting. We are asking that you either return the Proxy via the attached envelope ( stamp required) via mail or drop off the proxy into the White mailbox located on the wall to the clubhouse prior to the Annual meeting. It is most important that you return the Proxy asap. The Board Meeting was very well attended last night with 35 residents from both Sabal Harbour (SH) and Sabal Key (SK). ANNUAL MEETING will be next month 3/12. Each owner will be receiving a package of information. Please make sure to send back the Proxy that will be in the package. Five Board Members along with our Property Manager Shana Macri were also present. - Many Washingtonian palms were trimmed. The remaining palms at the pool will be done soon as the lift truck was not able to get onto the common area lawns due to the soft turf. These palms will be done soon. G&S has done the work. - The Social Committee has planned a Community Block Party for all residents of both SH and SK. This will take place on 3/9 from 4 PM at the field by the clubhouse. A food truck will arrive around 5 PM so that residents can purchase dinner for their families. There will be much more info coming soon on Nextdoor, FB and our web page. Please look at the attached picture. The Social Committee is also starting a book lending area that will be in the clubhouse along with a Book club that will meet monthly. Stay tuned for more info. - 45th Street is closed from SR 70- Pro Am Drive from 9pm- 5am through this week. Detour signs have been posted. The driveway at Aldi's will be blocked for three more weeks. - We are in the process of putting new street signs in SK. - The Board approved up to $ 2,400 to start replacing lawns in SK. We will start with 24 lawns from 4601 Sabal Key Dr. to 4717 Sabal Key Dr. Work will be done by Twin Palms. Irrigation will also be checked at these addresses so that the new lawns get the proper water and fertilizer. - Three new buildings have been approved for re-roofing in SK. These buildings are planned for March and the building numbers are from 4721 - 4761 ( Odd numbers only). This will bring the total of buildings completed to 15 with seven more to be done through next year. When finished we will have completed this project two years ahead of time. The project will cost $ 750,000 and all money was / will be taken from the reserves. - The Board approved the proposal for SH where 73 oaks from the entrance of SH back past the clubhouse will be trimmed. The one little oak in front of the Basketball gate will be removed and stumped. The proposal was for $ 6,205. Terry's Trees that handles all major tree trimming and cutting will do the work. - The Board discussed painting of driveways due to heavy oil stains that cannot be removed. More research will be done and if approved by the Board will require an ARC approval. - Two proposals for re-roofing the Clubhouse were discussed. We are waiting for another proposal and will approve one company next month. The quotes range from $ 12,500 to $ 14,500. We will vote next month. - We will be looking to form two committees in the coming month. We will have a lake erosion committee meeting in March (date not yet chosen) where we will meet along with our lawyer to discuss a uniform way of stopping lake erosion. Please email me jnes1021@gmail.com if you are interested in joining this important committee. - We are also looking for residents to form a landscape committee. As stated we will be improving the look at the entrances of SK and SH after the 45th project is finished in July. We will also be looking at the common area and the front of Townhouses in SK. -Several Board members along with Shana Macri will be meeting with FPL today 2/13 to discuss the crotch cutting that was done to the Oak trees along 51st street. We are not happy with the work that was done by FPL. We also brought to their attention that three holes were put in the PVC fence. We will expect them to fix the fence. - Shana is working with Florida Southern regarding a list of residents who had damage from the re-roofing project in SK. Our Social committee has a great party planned for all residents of SH and SK. We hope to see you there. Please put March 9th on your calendar for games and food. The party starts at 4 pm. Save the date!! More details coming soon!!! Starting Monday 2/4 the entrance/exit at Aldi's on 45th Street will be closed for the 45th St. project. The only opening/exit will be on SR 70. To date we have finished and paid for 12 buildings that have been re-roofed by Florida Southern. The project has gone well with just a few problems. With money still in reserves the Board has approved that three more buildings will be finished in March. This brings us almost one year plus ahead of schedule. At least two more buildings will be done by December leaving us just 5 more buildings to be done in 2020/2021. .
Because money is tight for the March project we will do three buildings that each have 6 townhouses. If there are any problems with houses still to be done we will look at each problem separately. Our Engineering company Karins assures us that all of the remaining roofs are in good and equal shape. The buildings labeled 1, 2, 3 will be done in March. ​If you are interested in running for the Board please contact either Shana or myself to get the paperwork required for the position. You can also attend the Board meeting and be nominated from the floor. As we have reported HOA dues that we found were late at $ 480,000 after letting Avatar go are now down to $ 160,000 after working with C&S and the Mankin Law Group. Yes some of this had to be written off due to Florida law but much has been paid by the residents who owed this amount. The remaining amount is under Lien meaning that money owed will be paid at the sale of the resident's house. This will never happen again. Congrats to both C&S and Mankin Law Group. Note that Mankin added on top of what was due so that we lost no additional money. ​We had an excellent number of residents at last night's Board Meeting last night. The full Board was present. 45th Street Project … Thanks to a tip from a resident the Pot Hole on 45th Street Gator quickly fixed the problem. They have always responded quickly to our concerns. VRBO Noise - Our lawyer approved that the Board can make a rule as to the excess noise that comes from not only all rentals but from all homes that make excessive noise after 10 PM. We will get this finalized and will report in a few weeks. If you are faced with a problem from a neighbor regarding after hour noise it will be important to file a police report. Pool Heater One of the four pool heaters failed and was replaced. Stucco Walls - We know that there are problems with at least two end unit walls in SK. The first one has been repaired and the second one is being looked at. We were made aware of a law suit that showed that Pulte had to pay $ 75 million for the same problem in other communities but the time period of 10 years is well passed. We will be reviewing this with our lawyers. We took $ 20,000 out of SK cash for our portion of the first fix. It is important that all SK owners have HO-6 home insurance. Attorney matters The Board agreed to accept two residents counter offers for payment of back HOA payments. The Board approved our lawyer's request to foreclose on two other houses. The Board is on top of all money due. Liens have been put on all owners that owe back HOA payments. Lawn Proposals - The Board approved that three areas of SK that lost three trees will be re-sodded. The Board is also looking to replace up to 15 front lawns in SK. Board members will walk SK and determine which lawns will be replaced. Lawn maintenance- G&S will work through 4/30/19. We are looking at other Lawn Maintenance companies for future contracts. Sabal Key Roofs … The Board approved that three more buildings will be reroofed in March. This will bring the total of new roofs to 15 of the 22 buildings … We will have our Engineering company look at the remaining buildings to pick the three that need the new roofs the quickest. We will finish the project in 2020. We are one year ahead of schedule. Note that all monies for this project came from reserves. Trucks parked in Sabal Key - Violation letters will be sent to any owner / renters that have commercial vehicles that are parked in SK. Power wash of SK - The Board approved that all sidewalks, car blockers and dumpsters will be power washed in February. Security Cameras - I am looking for three homes in SK to install cameras paid for by the HOA to look at dumpsters in SK. Clubhouse roof We will be getting three bids for the replacement of the roof at the clubhouse. Problems (or time bombs) - The full perimeter wall is a time bomb. While we have money in reserves it will never be enough money to replace part or eventually all of the wall. The Board has suggested that the wall is looked at by an expert and the parts of the wall that shows problems should be repaired. The Second time bomb is the problem that we are seeing with the Stucco at SK. We will have an expert look at all buildings in SK to see if we have any more problems. Insurance will not cover our costs. As stated above we are bringing this problem to our lawyer. Third time bomb is the repaving of Sabal Key. This will be a project that will have to happen in the next three to five years. We do not have enough money in reserves for the complete payment of this project. Finally the Board would like to get a committee of residents that will start meeting in March that will work on the replacement of plants, grass and look in both entrances of SK and SH. The 45th street project will be completed in May. We will be ready to act on the new look at the entrances of the properties. The back entrance to SH will be replanted after the 44th Avenue project is complete. - Sod has to be planted in three major areas where the three large trees were taken down in SK … I walked the area today with Twin Palms to take measurements for pricing. - Cameras placed in certain areas to at least look at the three dumpsters in SK. The cameras would be placed in three homes at a small monthly cost that would be picked up by the Board. We are receiving more and more furniture and mattresses and it has to stop. We will have our January Board meeting at the Clubhouse next Tuesday at 7 PM. All residents are invited. 45th Street E. Roadway Improvements from S.R. 70 to 44th Avenue E. For the safety of work crews and the traveling public, commuters are urged to adhere to the posted speed limit of 25 m.p.h. and to watch for traffic lane shifts, barrels, and flagmen when traveling 45th street E. between 44th Avenue E. and S.R. 70. ​Commuters should also adhere to the posted “Do Not Block Driveway” sign in front of Fire Station No. 4. In addition, performing U-Turns is prohibited in the fire station driveway. Flashers have been installed at the temporary four-way stop at the intersection of 44th Avenue E. and 45th Street E., which will remain until the intersection is signalized at the completion of the project. Due to the nature of the construction activities involved with the 45th Street Roadway Improvements project, access to sidewalks on the eastern and western sides of the roadway will be temporarily blocked. The sidewalk will be restored as soon as possible. We apologize in advance for any inconvenience this may cause as we work to complete these improvements. Curb installation along 45th Street E. from ProAm Avenue northward is complete, with crews now working southward. Sidewalk installation from ProAm Avenue northward is approximately 70% complete. Starting mid-December 2018, crews will begin installation of light poles. Paving activities have begun, with a new traffic pattern to be implemented starting January 2019, as crews begin removal and reconstruction of the roadway. To ensure the safety of work crews and the traveling public, commuters are asked to remain alert and exercise caution during this activity. Installation of storm pipe is expected to be completed in January 2019. Travelers may experience brief interruptions and delays in traffic, as well as periodic flagging operations to accommodate construction activities. Friday several of the Board members along with Shana Macri met with our Insurance company's representative from PCS, Anthony de la Torre. He stressed the importance that all owners of the 150 Townhouses in Sabal Key have HO-6 Insurance. The meeting started on time with a full Board and with a good number of residents attending . The Social Committee stated that there is a Coffee get together at 9 Saturday morning at the Clubhouse. This is free to all and bring something to pass as you enjoy coffee poured by Ryan from Cosmos Coffee. The Thanksgiving festivities have been cancelled. I think that it was a great idea and should try again next year. Roof replacement will continue at Sabal Key for the next 7 houses will start at the end of November. Florida Southern will continue to do the project until completion. After these 7 are completed we will have only 10 more buildings to go. 5 will be done in 2019 and 5 more will be done in 2020. We are one year ahead of schedule. Both SH and SK entrance lighting had burned out. Our Property management company got both areas up quickly. Christmas Lighting installation will continue and will be turned on by the end of the month. The Board approved two lakes to receive aerators in the SK area. Lake 16 and 17. Lake 16 is between SK and SH and Lake 17 is the largest lake behind Sabal Key Dr. and Misty Canal. Lake 16 is planned to receive 4 aerators and Lake 17 is planned to receive 3 aerators. It is our understanding that adding oxygen to the lakes will allow us to add fish and help to take care of the midge flies that are swarming our area. The Board approved a counter offer on a home that owes back HOA payments. This month we have received more than $ 30,000 in back HOA payments. Thanks to C&S and Mankin Law Group for all that they are doing in the successful collection of back payments. VRBO's we discussed ways to limit the noise that comes from the homes that are under VRBOs. More discussion and action is needed. The Board approved using money from the 2018 budget to landscape the clubhouse area. Twin Palms will be planting sometime soon. I have asked a resident to assist in the planning. The Budget was approved for 2019. SH and Common Area payments will be $ 66 and SK payments will be $ 293. 30 homes received final letters regarding violations. 16 homes fixed their problems before the meeting and 14 homes received fines. There is another fining committee meeting that will be in December. Lawns, dirty driveways and mailboxes, mold on the homes are being looked at in November's pass by from C&S. If the violation is taken care of by the resident the Board will work with you to possibly reduce the fine. Other notes - The new fertilization company (Twin Palms) has done an excellent job. The grass in the common areas in both SH and SK have shown improvements. The heaters are being turned on at the pool. The Clubhouse and sidewalks will soon be power washed. Sabal Key please keep boiling until we hear hopefully tomorrow … I am told that when the signs go down it will be safe to use the water normally. ​The key to a great relationship between a Community Board and a neighborhood is communication. Thanks to a resident from SH and last week a resident from SK writing on Nextdoor about the lights that were out in both Entrances, a Property Manager like C&S and a Board that cares we were able to contact the electrician and got both problems taken care of quickly. This is important to all the residents of SH and SK that will have their water turned off on the 13th (SK) and 14th (SH). When the water is turned back on the first thing is that it will be tested. They will look for chlorine levels and any problems that might be in the water. When the water is okay the signs in front of SK and SH will come down. When they come down if am told that you are okay not to boil. The worst case is that you will have to boil for 24-48 hours … again this is the worst case. ​I just got off an email chain this afternoon that discusses the water shut off next week due to the 45th Street project. This will affect Sabal Key and Sabal Harbour. Sabal Key's water will be shut off on 11/13 between 9 AM - 4 PM . This will affect ALL of Sabal Key. Sabal Harbour's water will be shut off 11/14 from 9 AM - 4 PM. The water shut off will be for Cabbage Key, Abacos, Breakwater and Runabout Way. ​NOTE THE DATE 11/13 It looks like utilities is shutting off the water at Sabal Key Subdivision on Tuesday, November 13, 2018 (next week) from 9:00 a.m. until 4:00 p.m. They are performing a water main tie in. They are asking their customers to boiled their water as a precaution or to use bottled water until they have cleared and tested the lines. ​So pleased to have a new and bigger American Flag at the Clubhouse just in time for Veterans Day … See the dove in the clouds? ​I am very pleased to say that the Project to put new roofs on the next seven buildings will begin 11/19/18. Please see the attached Map that will show you the roofs that will be changed. The Building numbers are 9,10,11,12,13,14,15. This will mean that 12 of the 22 buildings will have new roofs by the end of the first year. I am pleased that we are living through the budget on this project. This also moves the project up one year. Next year we will do 5 buildings and the year after we will do the last of the buildings. Note the we hired Karins Engineering Group that is watching over this project. They inspected the roofs on all buildings and gave us the roofs that had to be replaced first. There will be a group of people that will meet at the clubhouse to check out the Xmas decorations and rebuild the large garland that we use on the entrances to both SK and SH. This group will meet at the clubhouse this coming Saturday at 8 AM. We need 5-8 people to work here. Coffee will be served. At the same time we need up to 20 people hopefully from both SH and SK to put up the Xmas lighting at both SK and SH. With this number of people we can put everything up in maybe 4 hours. Please let Stephanie and I know that you want to assist next Saturday. It is very important that we get as many people as possible for this task. If all goes well the Social Committee will light everything up at the end of the month so that we can look good at Christmas. - We have no knowledge of any allegations of fraud or suspected fraud affecting the Association's financial statements communicated by employees, former employees, regulators or others. - We have no knowledge of any instances of noncompliance or suspected noncompliance with laws and regulations whose effects should be considered when preparing financial statements. Don’t forget to email us to sign up for the community thanksgiving!! We are asking that all residents bring a dish to pass including Turkey, all the trimmings, desserts and paper ware. Please email us before November 12 so that we know how many to plan for! Our very own board member Tim Birkey will be hosting! ​The next SHHA Board meeting will be Wednesday 11/14 at the Clubhouse at 7 PM. We will be discussing the Budget along with other business. It will be a busy night and an interesting night. I am looking for at least 20 volunteers for putting up the SK and SH lights this year. We will meet on the morning of 11/10 at 8 am at the clubhouse. With this number of people we can get the job done in 4 hours. We will stay with what we did last year without the plants and then will relook at new lighting when the 45th project is finished next year. After meeting with C&S yesterday we will be sending 30 violation letters today to homes in Sabal Harbour. The residents will have time to either work on the violation or meet with the Fining committee on November 7th. We are willing to meet with any resident who receives a Violation letter. Many residents have commented as to how pleased they are in the look of both SH and SK. Note that we will be having another Fining Committee meeting in December to work on other violations. The biggest violations are Mold on homes and fences, dirty driveways and poor landscaping including lawns. Please join the Board at the SH clubhouse Saturday 10/27 from 8:30 - 11 AM for Breakfast. This is always a very popular event. Last year over 150 people had Breakfast with us. Come hungry we always have a lot of food. The only thing that you have to bring is your family. All SH/SK residents are invited. Your children are invited to show off their Halloween outfits. ​I received a Nextdoor message from a new Resident of Sabal Key who asked why our STOP signs in Sabal Key were so old and beaten up. On one of my walk arounds I realized that the resident was correct. Today we answered that request by ordering 5 new STOP signs that will be delivered next week and installed soon after. Being a gated community the roads belong to us. Reminder that our annual garage sale will be Saturday 10/20 from 8:00 am - 2 pm. We have an ad running for three days in the Herald. Signs will be out front. We will broadcast on Nextdoor to many other communities. Good luck with your sales. While there were no major projects to vote on we still had a very informative Board meeting last night. - Terry Tree project in Sabal Key was finished with 34 Oaks being raised and 4 Oaks were taken down. - We are in the process of filling in the areas of the common area fence where small children were sent under the fence to open the gates for parents. We have also fixed the part of the fence that was pried open to let small kids in. We start working on the budget for 2019 next week. Accounts receivables that were once at $ 480,000 under our old Property Management is now down to $ 210,000. Most of the current amount represents 10 homes and these homes are currently under the watch of our Collection Law group … Mankin Legal Services. Jeff Midkiff discussed the many projects that the Social Committee is working on including prizes for Halloween and Christmas decorations of homes in both SH and SK. Watch both Nextdoor and FB for the projects that are being worked on. 45th Street Project Gator is now working on the street lights that will be installed only on the Peridia side of 45th Street. The walking bridge is also being installed near SR 70. By the end of the year we will have 12 of the 22 buildings finished. The first five buildings are finished and 7 more homes will be done in November. Note that residents in these homes are not allowed to install the DISH satellite hardware to the roofs. They have to be installed anywhere allowed except for the roofs. Any installation to the roofs will void the warranty. At the end of the year we will have spent almost $ 300,000. All money came from the reserves. With 10 buildings still to go we will finish the project in four not five years. We collect $ 73,000 of the HOA dues per year for the roofs. We will plan of the total project costing $ 650,000. As you have been aware this project is being managed by Karins Engineering. Both Karins and Florida Southern have done an excellent job. At the November meeting we will be voting on a proposal to re-sod at least 15 homes in Sabal Key. This breakfast is open for all residents in SH and SK. The Fall Garage Sale will take place in SH and SK on October 20th from 8 AM - 2 PM . The gates to SK will be opened by Tim Birkey at 7:30 on 10/20. Signs will be placed along 45th Street and we have a three day advertisement in the Bradenton Herald. Air BNB and Documents - We are aware that there are at least two homes in SH that offer a two day minimum stay. It is time for all residents of SH and SK to relook at our documents that were written 20 years ago. The first thing that we will do is to have a vote from all owners in both SH and SK to bring the votes needed for changing the docs from 67% of all owners to 33% of the owners. A mailing will go out to all owners once approved by both our lawyer and our Board / Property Management by the end of the year. Fining Committee Our committee will meet on 11/7. We are currently checking out current violations so that the owners of the properties are notified. We expect that up to 20 residents will be asked to either attend the meeting or fix their violations before the Meeting date. The next meeting was set for 11/13. We will have the next 7 buildings roof replacements done in November for SK.. This will give us 12 buildings out of 22 buildings that will be replaced. There are 10 to go and Florida Southern has promised us that if there are any problems with the remaining roofs that they will work with us. Commuters should also adhere to the posted “Do Not Block Driveway” sign in front of Fire Station No. 4. In addition, performing U-Turns is prohibited in the fire station driveway. Bridge crews are preparing for the setting of the two 45th Street E. pedestrian bridges over Gap Creek, anticipated to occur mid-October 2018. On or about September 21, 2018, crews will begin installation of new curb along the eastern side of 45th Street E. from 44th Avenue E. to Sabal Key. Once curb installation is complete, crews will begin installation of base, sidewalks, and light poles. ​Last night attended by a good number of residents we had our September Board meeting. Meeting started at 7:03 and ran for 1 1/2 hours. 5 Board members were present. - The pool will close at 5 PM Saturday so that the Social Committee can set up for a "Dive in Movie Night. " Tickets are still available and can be obtained by going to shhasocial@gmail.com. This party will be limited to the first 87 people that have reservations. ( See attached) There will be no alcohol allowed at this family party. The Social committee also reminded us that this Sunday 2-3 PM Kona Ice will be parked in front of the clubhouse. They will take cash / credit. All residents are invited. - Roofs at Sabal Key - The first 5 buildings have received new roofs and last night the Board approved 7 more buildings to be re-roofed by the end of the year. We are reviewing which of the 7 buildings will be next with our engineering company Karins. The cost for the next 7 is $ 154,000. The cost for the first 5 buildings was $ 134,000. Money for these 12 buildings will come from the Reserves. By the end of this year almost $ 400,000 will be in the reserves. $ 288,000 will be paid this year. We will add $ 73,000 per year and hope to have the final 10 buildings done in 3-4 years. - Pool Rules and Clubhouse rules have been updated. Any resident who rents the clubhouse will be reminded that if any alcoholic beverage is served at a party in the clubhouse that the renter must first provide a certificate of Insurance for general liability in the amount of no less than $ 1,000,000 naming the Association as additional insured. A suitable rider to a homeowner's policy extending coverage for the specific party or event will be acceptable. - Foreclosures were approved for two houses. We will continue working with Mankin Law Group on this process. - C & S and Mankin Law Group have done an excellent job at collecting past HOA dues. Nine homes represent 80% of remaining payments and each of these homes has been placed with the Mankin Law Group over the past year. - One home owner on Cayo Costa will be receiving violation letters on 4 different problems. - C & S will be hiring a company to look at the cost of repairing the Drain at the pool entrance. - A sidewalk on Misty Canal will be looked at for repair due to the inability to drain after rainfall. - Sabal Harbour resurfacing of Clubhouse parking lot will be postponed until after this school year. - We will be looking at landscaping in SK . There are a number of lawns that have to be replaced. Next meeting set for 10/9 at 7 PM. To all at building 5 in Sabal Key … the roofers will be working this Saturday to catch up with the schedule. About 14 months ago I was called by a mother saying that glass had been found placed in the sand in the playground. We were also seeing vandalism in the pool area. I presented this to the Board and after interviewing Security companies we purchased a system of 12 Very fine Hi Def IR cameras with a DVR capable of capturing three weeks plus of video to look over the Common Area. This replaced an analog system that was 9 years old and was not really working. With money in the budget this year we completed the system and now have 16 cameras. We had the installation company reposition one camera to look closer at the playground. We repositioned two existing cameras in the alcove to see the entire area. The new cameras will look at the areas that we had trouble viewing. We have had a few problems in the Common area since the cameras were installed in 2017. When there was a problem we took care of it quickly. There were very few problems this summer. Board members are able to see the cameras from their smart devices. We are talking with them about SK but have three major blockades no WIFI, no power and no housing. We are searching for new technology as SK needs cameras. Here is a picture of the playground and one of all 16 cameras. Commuters should also adhere to the posted “Do Not Block Driveway” sign in front of Fire Station No. 4. In addition, performing U-Turns is prohibited in the fire station driveway. In response to expressed concerns, Manatee County has implemented a temporary four-way stop at the intersection of 44th Avenue E. and 45th Street E. that will remain until the intersection is signalized at the completion of the project. Construction of the foundations for the 45th Street E. pedestrian bridge has been completed. Bridge crews are currently working on the structural steel for the new bridge deck. Once complete, the bridge deck will be poured and approach slabs will be constructed. Setting of the new pedestrian bridge segments is anticipated to occur on or about September 5th and 18th, 2018. Crews have begun installation of the roadway base course on the western side of 45th Street E., with installation of new roadway stabilization/sub-base underway on the eastern side of 45th Street E. beginning at Sabal Key and heading northward. Once complete, new curb will be installed. Installation of new curb along the western side of 45th Street E. is underway from ProAm Avenue to 44th Avenue E.
New light pole foundations are being constructed along the western side of 45th Street E. from ProAm Avenue heading north. Once foundations are completed, sidewalk installation will begin. Crews are working to finish up miscellaneous utility work along the eastern and western sides of 45th Street from ProAm Avenue heading north. 45th Street E. to 44th Avenue Plaza E. (over Braden River) Project Update Permitting and land acquisition are ongoing, anticipated to be complete in the Fall of 2018. Construction is expected to begin in mid-2019. Happy to let the tennis players know that the new LED lights have been installed at the tennis courts today. Note also that the lights will be on only until 9:15 each night. As the days shorten I will make sure that the start time is lessened. Note that the dial in the courts will only turn the lights on and has nothing to do with the timer that is located in another location. We figure that the lights that were replaced were very old and that the LED lights will pay for themselves over the years. The total cost of this was $ 4,100 and comes out of the Basketball / Tennis court reserve. One SK Roof is almost done and 4 more to come over the next month. Each roof takes about a week to finish. Florida Southern was made aware of the A/C covering problems and has fixed it. Stucco was replaced on two SK homes and will be repainted after the stucco dries. A new power unit for four homes in SK were replaced. Landscaping will be worked on and we will give credit to the four homeowners who had damage to their circuit boards. New fertilizing company Twin Palms has started to fertilize both the Common area and SK. Social Committee Stephanie Midkiff will chair some upcoming events including a ticket only movie at the pool. Watch for more info … A Breakfast is planned for October around Halloween. Lakes - Several of the Board members met with an engineer to go over the erosion of the lakes. Our lawyer has stated that this is a home owner expense to replace the land … We are working to see what can be done … We want to have a plan that would be universal in the replacement of land. Much more on this later. Pool Rules have been updated. More info will come on this shortly. There will be no more tents set up in the pool area. We are also coming down hard on families that bring glass to the pool. I will get the new rules out asap. Security Cameras were discussed for SK. There are more problems than solutions at this point but we are still searching as cameras are needed. Resurfacing of the Clubhouse parking lot was discussed. We found out that the parking lot has to be completely redone. Currently we have two bids and will look for one more. Reserves are at $ 11,000 current bids start at $ 16,000. We have cash that could be used for this project but are still looking at other bids. We will set a date for residents to come and talk about changing the documents. We will have this meeting some time in September. Trim the Oak trees of 44th Avenue (approved last meeting / scheduled this month) on both sides of the fence was awarded to Terry's Trees. There are 30 Oaks and the cost will be $ 4,050. The payment will come from our SH Tree Trimming budget. Trim the Preserve in the common area (200 feet) as the peppers are starting to push against the Common area fence. Two companies responded to the proposal. This was awarded to Terry's Trees for a price of $ 4,200. The preserve will be pushed back at least five feet. The final proposal that was approved is the repair and replacement of the signs at the back entrance of Sabal Harbour. We had two bids on this proposal. The bid was awarded to The Sign Factory for $ 1,344 for both signs. The next Board meeting has been set for September 11th at the Clubhouse. who for the second time blew through the back gate to Sabal Key. If you see if let me know. I thank the resident who witnessed it and reported the plate number. After listing many tasks that had been accomplished since the last meeting such as the many plantings on Sabal Harbour, trimming of 34 Oaks in SK, trimming of over 200 palms in SK, monuments in SH power washed, pool furniture power washed we then discussed what will go on in August. Stucco repairs on two homes in SK will be repaired, tennis lights will be replaced with better LED lights and the Oak trees along 44th Avenue will be trimmed. We received a payment from the State for two parcels along 44th avenue in the amount of $ 57,000. This check plus the check that we received for $ 32,000 will be held to pay for any work that has to be done to the front of both properties after the road work is finished. It is nice to have $ 89,000 in the bank for improving the three entrances at both SH and SK. $ 70,000 has been paid in back HOA dues in the past four months. We have 12 homes that represent 80% of the remaining total and each have received LIENS through our collection attorney, Mankin Law Group. Wet checks of all irrigation zones at both SK and SH were checked and repaired where needed in July. Some residents have received $ 1,000 fines. Please know that we want you to fix your problems. If you work to fully erase your violation we will erase the fine. If not the fine will be placed as a lien on your home. We reported on a meeting that several of us had with our attorney regarding the erosion of the ponds in SH. More information will follow. The replacement of five roofs at SK will start next week. Valerie Knoll of SK was voted in as our 7th Board Member. We are getting proposals for the cutting back of the preserve that is starting to overgrow the 200 foot fence on the Eastern half of the common area fence. The Board APPROVED the addition of 4 more security cameras. The Board APPROVED changing fertilizing companies in both Sabal Harbour and Sabal Key going from G&S/Lawnmasters to Twin Palms. We know that this new company will work with us to make the lawns in SK look better. We will discuss replacement of many lawns in SK over a period of time. The Board approved the trimming of Oak trees along 44th Street. Terry's trees will trim on both sides of the wall along 44th Avenue. The Board is looking at making the pool a safer place to swim and relax. New rules will be added to the old rules including issuing violations and suspension of people at the pool with alcohol and GLASS bottles. will be finalized at the next Board meeting. Both the Board and the residents that attended the meeting felt that both properties are looking better. We know that there are still some sore spots and these are already being discussed with owners or is still work to do. 8/6 Florida Southern Roofing will be replacing roofs on 5 properties. Product will arrive next week. This project will continue over the next 4 years. I would like us to get 5 more roofs done by the end of the year. 8/7 Terry's Trees will be finishing their work on the Oaks in parts of Sabal Key. We will have a July Board Meeting, Tuesday July 31st at the Clubhouse at 7 PM. Welcome one and all. If you live past the line from 4629 Sabal Key to 4606 Sabal Key back to the 4700 residences PLEASE move your cars tomorrow. Move them towards the front of the community. Terry's Trees will be trimming 34 Oaks and taking down 4 Oaks throughout Sabal Key. It is important that you move your cars that are normally parked there during the day time. This is planned for two days. New Plantings along Sabal Harbour Drive! Both myself and the Board are very pleased that another phase of the planned landscaping is taking place today on both sides of Sabal Harbour Dr. between Breakwater and 45th Street. We have Twin Palms planting almost 90 new plants. We are also replacing five plants along the lake on Sabal Harbour Dr. These will replace the five bushes that have no strength. Our irrigation company is doing the install and making sure that there is water for all the new plants. At the same time we are replacing the sod on the corner of Cayo Costa and Sabal Harbour Dr. in the common area. This is the sod between the curb and the sidewalk. Several weeks ago we planted 38 new bushes against the fence of the playground. At our July Board meeting 7/31/18 7:00 PM at the clubhouse we will be discussing two other sites that have not been approved at this time. Those two sites are in front of the clubhouse and on the island in the middle of Sabal Harbour Dr. The new plantings are all part of the making SHHA look better. Four new cameras should be installed making the final total 14 cameras. We will discuss this at the next meeting. Removing the Pepper trees on Cabbage Key Terrace along the lake. We have notified the owner and will take action if there is no response. The cost will be passed to the owner. Reroofing of 5 complete buildings in Sabal Key will be started 8/8. C&S along with members of the Board and the Mankin Law Group continue to successfully collect back HOA monies that are due us. We have put liens on all homes that owe us over a certain amount. I firmly believe that we will never get into a situation like we faced when we opened the books with our new Property Management company. Fining Violations continue … not as fast as some would like but we are working on it. We have signed a proposal for taking out the existing remaining hedges in front of the playground along the fence and planting up to 38 7 gallon Viburnum hedges in their place. At the last Board meeting held this past week the Board moved an additional $ 8,000 into the landscape budget from the Lawn maintenance budget. We can do this due to the change in area that our lawn maintenance company has now vs. the budget that was made before the road widening project. In the next month Sabal Key will see two tree projects. The first will be the Oaks. The Board has approved the proposal from Terry's Tree Service. We received three proposals from three companies. Terry's Trees has done business with us over the past four years. We are looking to thin 31 Oaks and will take down three Oaks in Sabal Key. The Project will take place in the next month. The price for the work was $ 12,500 and will come from the tree maintenance for Sabal Key. At the same time we have accepted a contract for up to 200 palms to be trimmed throughout Sabal Key. We have to take the palms off of the buildings throughout Sabal Key. The cost of this proposal is $ 3,000 and will come from the Tree maintenance for Sabal Key. The first thing that we discussed was maintenance for the Clubhouse air conditioner … the temperature in the Clubhouse for our board meeting was a very uncomfortable 84 degrees … We had a very good meeting and I was pleased that many of the attendees stayed through the 1hour 20 minute meeting. Roofs Sabal Key should start on August 6th. 5 homes are scheduled. A discussion regarding money was very positive. We have $ 354,000 in the Roof reserve and we are collecting $ 24,000 per month in roofing reserves from HOA payments. Lake Erosion was discussed. We will meet with the lawyer this month to further discuss. It was mentioned that we should move up to $ 70,000 from SH / SK cash into this account to be held as a reserve. This will be discussed further at the July Meeting. SH Planting $ 8,000 was moved from Lawn Maintenance to SH Landscaping and the first plantings were approved against the SH fence in front of the playground. We are going back to Twin Palms to get the price for taking out the remaining hedges and planting all new hedges … We now have $ 10,500 to spend in the SH budget. Sabal Key Tree Trimming - The Board approved a proposal for Terry's Trees to trim 31 Oaks and remove 3-4 trees. We will meet once before Terry's does the project. Tennis Count lighting The Board approved $ 4,500 from the Tennis court reserve to be used to install new LED lighting at the tennis courts. Fining letters were approved to be sent to the homes that were reviewed by the fining committee. We do NOT want to fine residents unless they do not bring their property to a better state . Cutting back in the Preserves was discussed. Proposals will be sent for at least two preserves in Sabal Harbour. They believe that they will be cutting through the entrance of Sabal Harbour either late this week or early next week depending on the weather. When this happens they will have flag people helping us get out. Please note that the best exit is the back exit on to 44th Avenue … then down to 37th Street. They were made aware that they pulled down a small chain fence to a back yard at Sanibel and are reviewing it. They were also made aware of the poor smelling water that is sitting in the Preserve behind the same house on Sanibel. Also note that they have put bridge barriers up down near the 7-11. The intersection of SR 70 and 45th Street will get busier as less number of vehicles can make two lanes going South at the light. Again 44th Ave to 37th street will be the best way out. Finally, I have continued to talk with Gator about their parking their vehicles on the front entrance of Sabal Harbour. Even though the grass looks very rough out there we are asking them not to park their trucks on our property. When pressed they are very good about removing cars. That part of the property will continue to look rough until the end of the project and then we will re sod the area. Along with the 31 Oak trees that will be trimmed and the 4 or 5 Oak trees that we will take down … We will also discuss and hopefully approve at the next Board meeting the trimming of over 200 palms in SK. There are many Palms growing against the homes in SK. Money for the Oak project and the Palm project will come from the Sabal Key tree budget. NEXT year we have to look at all the Oaks on the Islands in the parking spots. Eventually all these trees will have to come down. We will replant the island areas with another tree and fix the islands that are being pulled up by the roots. I am very pleased with the power washing of all townhouses and that project should be done by Tuesday. The Roofing project for the first five townhouses begins at the end of this month. Money for this project is coming out of the reserves. (Approximately $ 129,000). We currently have $ 350,000 in reserves for the roofs and are adding an additional $ 23,000 to the reserve monthly. I am requesting a price for the next five Townhouses that I would like to see the Board approve by the end of the year. The first five roofs were picked by the Karins Engineer that is managing the project. Three of these roofs were picked as the worse roofs that we had. I would be interested in any ideas the residents from SK have toward putting digital cameras throughout the property. Remember as of today we have no power and no Wi-Fi throughout the area other than in the homes. I have an idea AND ONLY AN IDEA that we would put cameras on the outside of at least 10 homes throughout SK. These cameras would go through your Wi-Fi and would be stored to a cloud account. My plan would be to pay for the infrared cameras through the existing budget … less than $ 200 per camera plus set up and pay for the storage from each camera which would cost $ 10 per month. There is a lot happening in SK … Your Board CARES! ​Remember that the pool is closed this weekend through probably Tuesday. We have a problem with a pump and chemistry. Due to the fact that people were in the pool yesterday … walking right past the signs ... we have had to lock the entire pool area. It is for your safety. ​One pump has failed and the other pump is having problems. According to the Pool company the pool will reopen sometime next week. No one is allowed in the pool. Sorry for the news. Pool cameras work Putting the cameras in at the common area have been very rewarding. Tonight I was notified by a regular swimmer at the pool that chairs had been thrown into the pool. When I checked the cameras I saw two boys who threw in the chairs but also threw in a bike three or four times. They repeatedly road the bike in the pool. I am hoping that no tire marks are at the bottom of the pool. They were at the pool around 1:40 - 2:20. We have good videos of who the boys are and I have asked the Board what they want to do with this vandalism. We believe that we know who the boys are. On June 1st we will be going through Sabal Harbour and will be writing Violation letters for missing house numbers (there are too many), missing numbers on the mailboxes and dirty mailboxes. If you receive a second violation letter in July you will be invited to the hearing ( fining ) committee. Fines start at $100 per day and can go up to $ 1,000. 35 Residents have been invited to the upcoming hearing (fining) meeting for other reasons like mold and lawns. If you are an off site owner email me at jnes1021@gmail.com and I will be happy to report back to you as to whether or not your house is up to spec with numbers and clean mail boxes. One last thing ... many of the homes built first have mold on their roofs and can easily be power washed for less than $ 150. Let me know if you are interested. We have several companies that are interested. We will be looking at the mold on the roofs next. Let's continue to make our properties look better. 45th Street Roadway Improvements from S.R. 70 to 44th Avenue East For the safety of work crews and the traveling public, commuters are urged to adhere to the posted speed limit of 25 m.p.h. and to watch for traffic lane shifts, barrels, and flagmen when traveling on 45th Street East between 44th Avenue East and S.R. 70. In response to expressed concerns, Manatee County has implemented a temporary four-way stop at the intersection of 44th Avenue East and 45th Street East that will remain until the intersection is signalized at the completion of the project. Due to the nature of the construction activities involved with the 45th Street Roadway Improvements project, access to sidewalks on the eastern and western sides of the roadway will be temporarily blocked. The sidewalk will be restored as soon as possible. We apologize in advance for any inconvenience this may cause as we work to complete these improvements. Crews are currently installing the main storm drain pipe along the western side of 45th Street E., working northward from ProAm Avenue E. Installation is expected to be complete by mid-May 2018. Beginning mid-May, crew will start installation of erosion control material around the pedestrian bridge, after which they will begin pile-driving operations. Residents should expect a substantial increase in noise levels during this time. Temporary striping and traffic lane shifts will be implemented to allow for this activity. Installation of storm drain pipe along the eastern side of 45th Street E. is currently underway from Sabal Key to Sabal Harbour. Construction of the barrier wall on the eastern side of 45th Street E. (across from Murfield Drive) is currently underway. Utility companies are actively performing locates/relocation activities along the project corridor. 45th Street East to 44th Avenue Plaza East (over Braden River) Permitting and land acquisition are ongoing. Florida Power & Light (FPL) is designing the relocation of transmission poles affected by the proposed roadway alignment over the Braden River. Detours/Lane Closures: Travelers may experience traffic delays and will observe periodic flagging operations as crews install pipe across the existing roadway. 45th Street information - They will be digging at the entrance of SH in the next week. It is advised that residents use the back entrance. 4505 Cabbage Key Rd. it was discussed that this house is a very interesting problem. We seem to have renters that should not be in this house ... everything is being done to oust them including a rent demand that if not met can lead to serious problems. Sabal Key Roofing for 5 buildings was approved through Florida Southern . Hopefully these buildings will start in July. $ 134,000 was approved for the first five buildings. The money will come out of roofing reserves. Sabal Key house power washing was approved using David's Home Service to do the work. This fee will be taken from the OTHER account. $ 5,500 has been approved for the cleaning. Clubhouse rentals was raised to $ 100 for rentals and the rules which are more strict than people thought will be put in force especially if liquor or beer is served. The rule states that "any renter/sponsor of a party or event in which alcoholic beverages shall be made available for consumption must first provide a certificate of insurance for general liability in the amount of no less than $ 1,000,000 for each occurrence naming the Association as additional insured. A suitable rider to a homeowner's policy extending coverage for the specific party or event will be acceptable for this purpose"
Our property manager will make sure that this is followed through. Any party that serves alcoholic beverages will be closed down if the proper paperwork is not provided. The Sabal Harbour bullnose landscaping was postponed. Two homes in Sabal Key are being reviewed. 4723 Sabal Key has a rent demand letter that was presented to the renter. It was discussed that alcohol at the pool is against pool rules. People that cause problems at the pool will have their pool pass cancelled. We will be writing a violation letter to a resident of SH. More work will be done by the Board and management regarding the fining committee. A forensic accountant has been hired to look at possible missing funds from the previous management. All ponds in SK and SH are paid through the $ 63 payment made by all home owners. If your HOA account is under the attention of our lawyer your pool pass has been terminated. You will also not be able to rent the clubhouse. Residents who use the pool and common area please do not let others in just because they say that they do not have their pool pass. To all residents of Sabal Key please note that today I signed paperwork for our Lake company to spray lakes 16 and 17 ( the major lakes in SK ) three times. This should help in killing the white flies that are swarming parts of Sabal Key. More information regarding the person at the pool who should not have been there ... After reviewing the digital tapes that we have running 24 hours around the common area I believe that this was a person dropped off ... but I would like to read the police report and talk with the two dads that were at the gate as the policeman talked with the person. Here is what I can pull from the tapes. 5:28 PM A white SUV pulls into the pool parking area and sits parallel to the normal parking area for up to 5 minutes. 5:33 Another car comes in ( no relationship to the car waiting) and three ladies get out to go into the pool area. 5:34 The man gets out of his car ( passenger) and fails to get to the gate in time. The gate locks . He calls for one of the ladies to let him in and one comes back to let him in. (BIG MISTAKE) The white car that he came in leaves and goes out to 45th Street. 5:38 He plugs his cell phone into the wall by the ladies room. 5:40 He is pool side sitting on one of the lounge chairs next to the shower by the clubhouse. 5:58 He starts smoking from a vapor cigarette. By this time there are many very young kids playing near him. There are ladies to his right and a family on his left. He doesn't seem to bother anyone. He stays by his chair for the next 20 minutes. 6:25 gets up and tries to fill up his water bottle but realizes that we have locked the water. He uses the shower to fill his water bottle. 6:29 He moves closer to the family on his left and it looks like they talked . 6:42 Very few families are left at the pool and he jumps into the pool. 7:09 He picks up everything except for his phone and leaves. 7:09 Meanwhile a family has called the police and as the man leaves the gate he is met by a policeman. They talk for almost five minutes. The man gives the policeman what looks like to be his license. So what do we learn from this. This person did not look like a homeless person. He had just the right number of clothes that he needed to go for a swim. Letting people in after you because they "do not have their key" is wrong. We were very lucky that this person seemed peaceful. Throughout the time that he was in the pool area maybe 20 kids were playing in his vicinity. People do not have keys if they do not live here or are not in good standing with the HOA. Please do not let them in. The cameras worked very well. I am so pleased that parents called the police and let the police handle this situation. The Board has picked the company that will be doing the first 5 roofs in SK. Buildings 4-5-6-7-8 will receive roofs first. We believe that the roofing will begin some time in April and will advise as soon as we know the exact date. The police were called and removed a white male around his 20’s-30’s from the pool/clubhouse this evening. I have seen him a few days ago charging his phone. Brown/black hair near shoulder length and around 6ft tall with a backpack. The officer told him to not come back and if residents see this guy again on the property, to call them and they will arrest him for trespassing. Stay alert and call if you see this guy around our neighborhood. Break-ins might be next if we don’t do anything about it. This is written sadly to the people who will never read this ... but I will try anyway. There are people in SK who believe that the way to throw garbage into the dumpsters is to throw it over the fence not caring at all where it lands. W**. Really! Were you born in a barn. Did you live in the streets. I would love to know who you are. Residents of SK please keep your eyes open and help me find these people. Also furniture does not go into the dumpster area ... you are responsible for getting rid of furniture, old rugs etc. There will be a vote by the Board on Wednesday at 7PM at the Clubhouse for the company that we will award a contract to replace roofs on Buildings 5,6,7 and 8. We will have a engineer from Karins Engineering present at the meeting. SK residents will have a chance to ask the engineer questions. We look forward to a very busy year. Please look at this lock that is on the tennis court gates ... could it have been damaged by stiff winds or by some kids who are bored and looking to break something ... We will get it replaced and we will all pay for it. We have two Board meetings this month. This Tuesday ( 3/13) is our Annual Meeting. There are six people that have submitted their paperwork to be on the Board for 2018. They are John Nesbitt, Bill Leggett, George Martin, Jeff Midkiff, Tim Birkey and John Pardi. We would like one more person from Sabal Key. The meeting is at 7 PM at the Clubhouse. If you have not submitted your proxy please either leave it in the white box by the clubhouse, hand it to the Property Manager Shana on Tuesday AM or bring it to the Annual meeting. The Spring SH SK garage sale will take place on 3/17 from 8 am - 2pm. I will be placing advertising in the Herald and will make sure that readers will note that even though we have chaos on 45th Street that we have many homes that want to sell stuff! Signs will be placed in the usual places even though some of those usual places look a little different. Good Selling! A person takes up to 10 very, very deep breaths and then is held against the wall until he/she comes close to passing out. Note that this is happening in homes but also at the pool. This is also a National problem. I had the ability to ask Medical people about this Monday as I volunteer at Sarasota Memorial Hospital. They too were shocked. This practice stops oxygen from going to the brain. Please read the attachments that I have put at the end of this post. It discusses the practice of Blacking out and the medical problems that each person might face. Again the main point that I want to make is that the male teen stated the his Mother taught him how to Blackout and that they do it at home. Younger kids were saying that it is alright to do. I asked for the person's telephone number but he declined to give it to me. Please if your teen is going to the pool ask them what they are doing and note that people under 16 are not allowed at the pool without adult supervision. If your child is practicing Blacking out and they are surrounded by kids ... who is going to get them breathing again if they stop breathing. The Manatee garbage pickup page states that they celebrate Presidents’ Day. So it looks like garbage will be picked up Wednesday and Saturday with recycling done on Thursday. Parents of teens in SH and SK ... when your kids say that they are going to the pool after school and after dinner start asking some questions. We have some big problems that parents are not aware of. As many of you know the Board approved almost $ 10,000 for cameras that cover most of the common area. Because of this we have very good coverage of the pool area especially in the Alcove. There are two tables and ten chairs in the alcove. There were girls going into the Men's room with boys and boys walking into the ladies room. Bathrooms are always getting trashed when these kids are here. The most important thing that I want to say in this post is that I had heard that there was a form of suffocation being practiced by several kids. Yesterday I talked with two of the kids that came to the pool and they stated that yes some kids are going into the bathrooms with others. They are taking ten very deep breaths before standing straight up and another person pushes the kid's chest holding him/her against the wall until they almost pass out. There are two kids that do not live here that I am waiting to talk to, These kids seem to be ringleaders. One of these boys vapes heavily and bangs his head repeatedly as if he is air drumming. Tapes show him last Saturday night (2/10) surrounded by kids that are maybe in middle school watching him as he vaped. The gates lock at 8. Everyone should be off the common area by dusk. Please take time to talk with your kids about this ... and if you have a neighbor who does not read Facebook, our Web site (www.sabalharbourkey.com) or Next door please share this info with them. The gates lock at 8. You cannot get into the Common area but others who are already in the area can open the gate from inside to let them in. Everyone should be off the common area by dusk. Please take time to talk with your kids about this ... and if you have a neighbor who does not read Facebook, Our Web site (www.sabalharbour.com) or Next door please share this info with them. I am pleased to inform all families that the back gate to the common area has been fixed today. I am so sorry that it took so long to do so. Also in the next few weeks I will have gathered information as to the vandalism that is going on at the pool and the rest rooms. We have some major problems with some of the kids that frequent the alcove of the pool after school and after dinner. I read tonight that there was a gunshot (s) near the clubhouse on Nextdoor. After reading that I immediately went to the clubhouse and talked with the off duty Sheriff who stated that there was/were no gunshot (s). He believes that there was a backfire that was heard. He did kick some kids out of the playground at 8:30 but nothing else was reported. Our Property Manager and Board were made aware of the problems at the pool this weekend. I have the videos from our cameras of the four kids that were tearing around the pool on their bikes and will work to find the parents. I believe that these are the same kids that ride their bikes around SH on one wheel. We will find the parents and will let them know what their kids are doing. Let me answer the question that I have received several times in the past few days. Twin Palms has turned off all irrigation to the front lawn zones for both Sabal Harbour and Sabal Key along 45th Street. The rest of SH and SK will have normal irrigation. If there was one thing to say after seeing the Project tonight is that you should " Learn how to go North before you go South". If I were a resident from SK or SH I would take some time this weekend and learn how to either make your way through Peridia ( three entrances) or make your way to 44th Avenue and find 37th Street, 30 Street or SR 301. One should never plan to go through the SR 70 / 45th St intersection especially during the busy times ... which might be most of the day. I have a chart attached that you will be able to see that they will start at the SR 70 intersection and work their way back to 44th Avenue. The project should take 16- 18 months and should end sometime in the Summer of 2019. Traffic lights will be added to the 45th St / 44th Ave Intersection towards the end of the project. We will not lose our wall or shrubs. The sidewalk should remain where it is ... maybe changing by a foot or two. the road will be four lanes plus turning lanes into both SK and SH. There will be a grass medium in the middle. In the long run the road will look great and it should increase our Property values ... We just have to bunker down and learn our way out. ​The tree project will continue Friday and Saturday this weekend on 45th St. If you want to be on the SHHA Board for 2018 please let me know. We are looking for Residents that want to possibly join the Board. There will be a lot of discussion in the coming months regarding the fact that we have to change the documents that the Sabal Harbour Homeowners Association ( SHHA ) has lived under during the past 20 years. We all know that this will be difficult due to the fact that we need the signatures of almost 370 Home owners. I am looking to see at least 10 -15 residents including Board members who want to be on a committee to review and change the documents. Our lawyer will have to be called into this as the time goes on and then there will have to be a group of residents who are willing to go door by door to get signatures. Please let me know if you want to be on the committee at jnes1021@gmail.com I am looking for both Sabal Harbour and Sabal Key Residents to be involved. FPL just informed me that the trees will be taken down starting Friday and will go through Saturday. Any damage to the wall will be covered by the County. I have taken pictures of the wall today so that we have current pictures of the wall as it stands today. Maybe this will help a few people but I am sure most of us know the roads to get out during the upcoming widening project. i would suggest that if you are not that familiar with the roads do some tests in the next two days. All of know that the back up at the SR 70 light is vicious during certain times of the day ... Even traffic is backed up to Pro Am Drive in Peridia. If you do take Pro Am Drive and want to cross SR 70 then go straight to 37th St and take a left. When you cross SR 70 you will be on the new Tuttle extension ... You can take this all the way to Sarasota. If that is backed up take a right on 45th St. and go to either the first left Muirfield Dr. or the next left Fairfax Dr. and work your way back through Peridia. Or take a left on the new 44th Avenue and go to either 37th street or on to 30th Street ( to Walmart ) or Rt. 301`. ​Or go out our back way in SH and just stay on 44th. If you missed the mailing from Manatee County I have attached the mailer that announces the 45th Street Widening program I have attached the pdf file. Remember that there is a very important meeting on 2/1 that is discussed in the mailer and also remember that this weekend we will be losing up to 36 Oaks that are growing along 45th Street. I have had FPL mark these trees so that you can see which trees are coming down. To Sabal Key Residents ... there will be a pre-bid meeting for the Roof replacement of four residential buildings (see previous post for addresses) on 1/31/18 at 9 AM on Sabal Key Drive. To date we have three roofing companies that will attend. One more will let us know. Our next Board meeting will be on January 30th at 7 PM at the clubhouse. You will all be receiving a letter from C & S regarding the Annual meeting next week. There has been talk about speed bumps for Sabal Harbour. I have been in touch with Jeff Bishop, Senior Engineering Specialist Manatee County, and have attached a letter from him regarding the study that was done last year. There was insufficient criteria to justify speed bumps. They will be placing some "Your Speed Is" portable units along Sabal Harbour in the coming weeks. He also stated that if we see any construction vehicles coming through Sabal Harbour during the road project that I should let him know immediately. Update on tree removal for 45th Street ... Bill Leggett and I just met with FPL this afternoon. FPL will remove the 36 Oaks and up to 9 Palm trees during the weekend of 1/27/18. It looks like construction trucks will start arriving for the widening program during the second weekend of February. The project begins. Once done I am sure that we will be pleased with the look in front of Sabal Harbour and Sabal Key. Please remember the important meeting on 2/1. You will see this announcement on this page. Bill Leggett, George Martin and I will be meeting with FPL to discuss the upcoming 45th Street widening project and the trees that will be taken down in front of both the Sabal Harbour walls and the Sabal Key walls. We will lose up to 36 Oaks and 6 Palms. At first FPL did not want to Stump each tree but after working with the Board FPL did in fact say that yes they would pay for the stumping. We believe that the Widening project is now on for March and it will be an 18 month project. Thankfully 44th Avenue is open and that will be a good way to get out. Also going through Peridia will be a good way out although they are not too happy about that. Losing the Oaks are terrible but in the long run Oaks are the worst trees to have as they will eventually grow into and through the wall. We will be in conversation with the Manatee Government to see if they could pay for the replanting of new trees. I will be personally knocking on the doors of all residents who have these trees in their view so that they know what will be happening. We expect that FPL will be taking the trees down in the last two weeks of February. Stay tuned as more information will be coming after our meeting tomorrow. I will be working this week on getting more information regarding speed bumps in Sabal Harbour. Let me know via email. Jnes1021@gmail.com if you would like to attend a meeting this month regarding speed control in SH. I have been in contact with a Board member in Peridia who had no luck getting more speed bumps in their property. Let’s see what we can do. Jbnesbitt. Important information regarding the 45th Street widening program. Please mark your calendars for 2/1/18 from 5-7 PM at the Manatee Technical College, Wagoner Auditorium. Representatives from Cardno Engineering, Ajax Paving, Project Managers will be attending. Manatee Public Works will chair the meeting. The format has not yet been determined. Drawings and construction maps will be available as will several engineers to help respond to questions. This is a VERY IMPORTANT meeting that we all should attend. While I have you and if you do not yet know FPL will be taking 36 Oak trees and 6 Palms from the front of SH and SK along 45th Street. If there is a power pole in front of a tree that tree will be cut down and will be fully removed including the stumps. We asked FPL to pay for stumping and they have approved the cost. We have been told that any trees that have no power lines in front of them will be saved. If you have not yet traveled down the fully opened 44th Avenue this would be a good time to become familiar with this road ... It really will be the avenue out especially from Sabal Harbour. More as information comes to us ... Jbnesbitt, President SHHA HOA. I am very pleased to let SK and SH residents know that new mulch will be placed throughout SK and the common areas of SH starting Wednesday. Time to take down the Christmas decorations ... I’m looking for a team to do this on Saturday 1/6 at 8 AM. We will meet at the Clubhouse. Let me know if you can be there. I will be unplugging the decorations today. My thanks to Tom Wilson (SH) , our Maintenance person Juan and his brother Neil for their help in getting the Christmas decorations taken down. This past fall the SHHA Board hired Karin's Engineering Group, Inc. to work with us to review the shape of the roofs in Sabal Key. Karins has an excellent reputation as Building engineers. The agreement that we signed will keep Karins as a partner throughout the entire Roofing partnership. This program will take us through the 5 + years. Karins will inspect the roofs, write the proposals and work with us to pick 5 contractors to give us sealed bids for the projects. They will look at the work being done throughout the years and make sure that the reroofing is done to spec. This is a long term project and they will be there for us. There are 22 roofs in Sabal Key. These roofs cover townhouses the have 5, 6 and 8 units. Karin's engineer Michael Reeves spent one day and walked on all the roofs looking at the visible structure of each roof. He found that four roofs have to be replaced within the next six months. Most of the other roofs can be changed over the next 5-6 years. When problems pop up on the remaining roofs they will be spot repaired. Two of these buildings will receive Blue tarps over several open spots. These are buildings 5 and 7. Note that the entire roofs will not be tarped. There are several areas that have to be tarped. At the same time Karin will be writing the proposal and contractors will be notified. We expect that work will start in March / April. Sadly there are reasons that areas on Building 5 and 7 have to be tarped. For example this should take care of a leak that is occurring in 4605. The cost of this project is much higher than first thought. Numbers in the past are too low. I have an idea however that I have presented to the Board where I believe that any future assessment might not have to be done. You will however see your HOA dues rise $ 5 per month this year and the money will go towards the Roofs. Yearly HOA costs will go up some as needed. I believe that a total $ 60 this year is much better than an assessment. We are looking at Common area costs that you also pay to see if there is any overage. This year there was no rise to your Common area payment. Here are the Numbers (ballpark numbers are given) With five contractors looking for our business we hope that the competitive market will keep our costs low. Money has to be paid WHEN work is done. We will also get strong with the owners who owe HOA dues in SK. These monies will go into the roofing fund. Anyone in both SH and SK that are over 2 months overdue will get a letter. After one letter they will be sent one more letter stating that their account will go to a Collection lawyer that we have contracted in St Petersburg, Fl. The Collection lawyer will add their cost to the collection so that we do not lose any percentage of what is due. The owner will have 30 days to settle their account with our Property Management. We have already started collecting from overdue residents. In some cases seeing that they were never told they did not know that they had late payments. In other situations liens have been placed against their homes. We are willing to work with any owner that owes us money. The key to this project is that we do not waste money. Having Karins as a partner should keep this cost down. Another key is that SK residents pay their HOA dues. Very brief meeting tomorrow to approve the 2018 budget. The longer Board meeting will be next week. Jbn. Sabal Harbour and Sabal Key have made a great friend with FELT. ... Feeding Empty Little Tummies in Manatee County. They are all very impressed with what our community has given in the past three weeks. Our food tubs are located in the Clubhouse through the middle of December. Remember when the Clubhouse is closed you can drop product by my house at 4612 Egmont. If we are not home please leave your donation by the front door. You can also do what I did ... go to feltinc@org and give them a monthly donation. A little money goes a long way. The four wreaths on the gates ( gate fixed again) stay on for 6 hours then turn off. Usually by 6:20 PM they are all on. The other lights in SK stay on throughout the night turning off around 7AM as they are tied in to the electrical power that lights the SK signs. At Sabal Harbour I am still working on the automatic turn on / off of the tree and deer. They will not stay on all night due to possible vandalism. The rest of the lights will stay on from dusk to dawn. Thanks for all the kind words. We are getting a lot of nice comments. Thanks again to the committee led by Terri Marcus with help from Board members, John Studebaker and many others from SH. With the exception of putting lights on the clubhouse I am pleased to say that we are done with the Holiday Decorations at the front of SK and SH. my thanks again to Terri Marcus and a good crowd Friday from Sabal Harbour who put everything into motion. My thanks for all the SH residents who assisted in the Xmas decorations today. Hope to be ready to tomorrow to power up. I am looking forward in seeing all the neighbors who let me know that you want to assist in setting up the Christmas Decorations at the front entrances of both SH and SK. We will meet at 9:30 in front of the clubhouse. This will be a great event for all ages. We have a small team of families that have said that they would help install our Christmas Decorations starting Friday at the Clubhouse at 9:30 AM. We might also go into Saturday. We really need more smiling holiday faces to assist in the installation. PLEASE consider assisting us starting Friday at 9:30 AM. I am very pleased to say that the water leak has been fixed. We still have to rebuild the front yard of one resident but it went smooth and easy once we got all of our cards lined up. The only street to lose water was Runabout in SK. I put signs on all doors talking with residents where possible. The boiling drinking water was not mandatory. Thank you all for your patience. That was one of two large water breaks this past month in SK. We had the major irrigation pipe in Sabal Key fixed earlier in the month. Always something ... Happy Thanksgiving to all especially all the good people that I met on Runabout over the past weeks. Remember ... if you have a food donation for FELT Feeding Empty Little Tummies we have a Drop Off Boxes at the Clubhouse. These Boxes will be available only Tuesday Morning this week from 9 - 12:30 due to Thanksgiving. You can also leave your donations by my front door in a bag at 4612 Egmont at any time. I will get your donation to the boxes in the Clubhouse. Christmas Decorations. ... we have a small committee with some great ideas but we are going to need manpower the Friday after Thanksgiving from both SK and SH to get the decorations installed. There is a lot of great feeling ... positive feeling about what we are doing over the past six months ... but I really need your assistance with the Christmas install. The more people we get the shorter the time will be. I will let you know the time on Friday but please email me if you can give us your time Friday. This is very important. Bring your kids as it will be a fun day. Please email me at jnes1021@gmail if you can help. FOOD FOR F.E.L.T ( FEEDING EMPTY LITTLE TUMMIES My thanks to Terri Marcus for bring this excellent food donation program to my attention. Starting tomorrow night at the November Board Meeting residents of Sabal Harbour and Sabal Key can bring food items (see below) to the Clubhouse. The program will go through 12/5. F.E.L.T is a Manatee County non-profit organization that fills 350 backpacks every week for school aged children. The backpacks are filled with 3 meals for both Saturday and Sunday. Without these backpacks these children would go hungry from school Friday until school breakfast Monday. There will be three tubs placed in the HOA office for you to drop off your donations. If you wish you can drop food items at my home (4612 Egmont Dr.) and I will make sure that your donations get to the Donation tubs. If you prefer to make a cash/check donation please leave it at the HOA office. You can also do what I did and go to feltinc.org and make a monthly donation. ​Board Meeting 11/15/17 We had a spirited meeting last night at the clubhouse in front of a fair number of residents. We discussed the following: Finances were presented for the first time since the change in Property Managers due to the fact that much work had to be done to get the past managers financial information into the C & S way of entering and reporting financial information. Sabal Key Roofs- are being looked at by Karin's Engineering. This company will determine which roofs will need changing and when. In most cases they believe that roofs will be changed over the next 5 years. They will issue a full report to the Board once they look at all 22 roofs. 45th Street Widening Program now looks like it will start in March, 2018. When they are ready FPL will take down 36 oaks that are next to Power lines. Most of these oaks are in front of Sabal Harbour. 44th Ave Widening program has no date as of yet but we learned that theyh will not take any part of our fences on 44th Ave. They offered $ 48,000 for two parcels of land that they need and we have come back to them with $ 65,000 for the land. Vandalism in Sabal Key and Sabal Harbour is at a long time high. We lost a tennis net last Thursday but found the family that was responsible. They will be charged. Several nights ago two boys and one girl we running out to moving cars in Sabal Harbour. They were playing a game of chicken. We will talk to the family. We moved a security camera to look at the tennis courts. Accounts Receivables For the first time we sent letters to residents who were behind in their HOA payments. Because of this letter many residents have either paid or have set up payment plans. For those who are still behind in payments we will send them to a collection lawyer. This company will add their cost to the amount due so that we will get back 100% of the overdue money. Work in Sabal Key - Palms were trimmed of seeds and dead fronds. The mailbox was painted. The sidewalks were cleaned and the leak will finally be fixed on Monday on Runabout. Irrigation - we are getting closer to where we want to be but still have a way to go. We approved that mulch will properly be placed throughout all of SK and the common areas in SH. This should be done before Xmas. We approved to spend up to $ 2,500 on Xmas decorations that will last through the years replacing older product. We have a Christmas committee and can use your help on the Friday and Saturday after thanksgiving to put up the decorations. The FELT boxes have been placed in the Clubhouse. Please see my post on this on our Facebook page. Have a great Thanksgiving and if you can help us on the two days after Thanksgiving please let me know. We have a good committee but need more hands. For all residents of Sabal Key. Tonight the Board approved a large mulch proposal for Sabal Key. This job will be complete before Christmas. Please do not mulch your yard. Mulch will also be done throughout the common area in SH including the front and entrances of both places. We will not mulch over shells. Sabal Key residents. Karin’s Engineering Group will be looking at all the roofs on Thursday in SK to see how much life are left in them. Each roof will be looked at in detail. We will get a report at the end of the study and will report on the condition of each roof. Just a reminder to join your Board for Breakfast Saturday from 8- 10:30 am at the Clubhouse. Bring the kids and have them wear their Halloween costumes. We promise great food and strong coffee! To all Residents of SH and SK On a very serious note if you received a letter from our Property Manager ( C & S Community Management Services ) dated 9/29/17 stating that you owe HOA fees please know that on 11/1/17 we will be sending your account to a collection lawyer based on the total that is due. Before that both Shana Macri and I will be very happy to work with you to see if your account has any posting errors. We want to do as much for you as we can before your account is sent to the lawyer. If your account is sent to the Collection Lawyer you will be billed for their additional services to collect the amount due. Please email me at jnes1021@gmail.com if you believe that together we can work on your statement. We had a very good Board meeting last night. Our Insurance agent that handles the insurance for Sabal Key met with close to 20 SK residents to discuss our insurance policy. He left packets of information after his presentation. If you would like to pick one up from the Property Manager please stop by and pick one up while the supply lasts. We passed a motion to Power wash all sidewalks and curbs in Sabal Key. This will be started soon. Many people were impressed with the current look in SK. The power washing will only make it better. We passed a motion to accept Karins Engineering Group to be the company that will start by looking at all roofs in SK and decide when each of the 22 roofs will be replaced. They will stay with this project until the end. KEG is a very respectable engineering company who is well known to C & S. My comment last night was if we are going to have a project to replace roofs on $ 18 million worth of property than it better be done right! KEG is the company to do this. Our maintenance person is going to sand and repaint the mailbox frame in SK. We also discussed that the contractor who started working on the erosion problem on Lake 17 in SK will continue to get that job completed. Irrigation problems such as broken heads and leaks will be fixed in SK. We passed a motion to send our accounts receivables to Mankin Law Group. The first letter to residents who owe us money has gone well. It will cost us NOTHING to send our receivables to Mankin. They will add their costs, late fees etc. and pay us what we are due once the money is collected. This is a very big step that should have been done long ago. We will continue to work with anyone who wants to get their HOA dues paid. Email me at jnes1021@gmail.com if you want to work on your statement. We will also bring the existing work that our attorney has to Mankin. Three Board members have been working with the Management of G & S Landscaping. Work continues and with the refocus of their management things are getting done. The 44th Avenue widening project notified us that we will not lose the wall at the North entrance in Sabal Harbour. We are also looking at receiving up to $ 50,000 for the project if not more. Finally, please plan to attend our Halloween Breakfast Saturday at the Clubhouse 8 AM - 10:30 AM. Have your kids dress up in their costumes. Good food will be served and of course candy will be given to the kids in costume. We are receiving thank You’s to G&S Landscaping for the job that they did in Sabal Key today and tomorrow. Two teams spent the day in SK cleaning, thinning and pruning all around the Sabal Key buildings. My personal thanks to Shane Henry, Shawna Frank and Aaron Hochstetler (Board Members) for focusing G&S on the problems that had / have to be tackled in SK. While I have you we should be voting on the sidewalk power washing on Sabal Key at tomorrow’s meeting. This power wash will go right to your front door. We are also going to sand and paint the mailbox frame in SK. As I was walking through Sabal Key today I did notice that there was still work to do with the irrigation system. I will get people on it. Tomorrow at the Board Meeting starting at 7:00 pm we will have a person from our insurance company who will discuss our insurance coverage and will answer any questions that residents of SK might have. I have set aside 15 minutes for his presentation. He will speak at the beginning of the meeting. Saturday morning the Board will have a Halloween breakfast for all residents. Please join us for breakfast between 8 - 10:30 at the Clubhouse on Saturday morning. Residents of Sabal Key please think about attending our HOA Board meeting this coming week ( Wednesday October 25th 7 PM) as we will have the Insurance agent present who will take the first 15 minutes of the meeting explaining the SK coverage and what you as Residents should know about Homeowners Insurance for your townhouses. Also thanks to all who participated from SK with the Garage sale. There was a problem with one of the gates but buyers were able to get through the exit gate starting at 7:30 AM. Finally at around 9:30 both gates were opened. It was a pleasure meeting with and talking to all of you yesterday. The next project for Sabal Key will be the power washing of all of the sidewalks in SK from your front door to the parking lot. This bid will be discussed and voted on at the Board Meeting. We are also working to get the mailbox area painted. Remember next Saturday 10/28. 8 am - 10:30 am your SK/SH Board will have a breakfast for all at the clubhouse. Please have your children wear their Halloween outfits. Candy and a Good breakfast will be offered. Thanks to Bill Leggett, VP Board of Directors for finding out that we will not be losing any part of our wall for the 44th Avenue Widening program. Initially we learned that we might lose up to 100 feet of wall plus the sign but after a review with the engineers ... the wall is safe. That is good news for the houses on 44th Avenue. Their property lines are SAFE! After the beating that the clubhouse has taken in the past weeks we will hold to the rules. There will be no more pins placed in the walls of the clubhouse. Also any tape leaving a mark will be taken out of your deposit. These are all part of the current rental contract and will be enforced from this point on. The clubhouse will no longer be a pin cushion. I received a nextdoor email from the Safety Director in Peridia stating that coyotes have been seen in Peridia and several animals have been killed. Please keep your garbage lids tight on garbage day and be careful if you let your pets outside. The Board meeting has been pushed back until Wednesday 10/25/17 at 7 pm at the clubhouse. To all residents of Sabal Key and Sabal Harbour. Please put 10/28 at the clubhouse for a Halloween breakfast made by your Board members and friends. Breakfast will be served from 8 am - 10:30 am. Children are invited to wear their Halloween costumes. Candy will be handed out to all in costumes. Our last breakfast was a big hit with almost 175 people enjoying breakfast and talking with the Board. We hope to see you at the Clubhouse. Just a quick message to invite any resident in Sabal Key and Sabal Harbour to our October Board meeting at the clubhouse at 7pm Wednesday 10/18. Meetings usually last one hour. 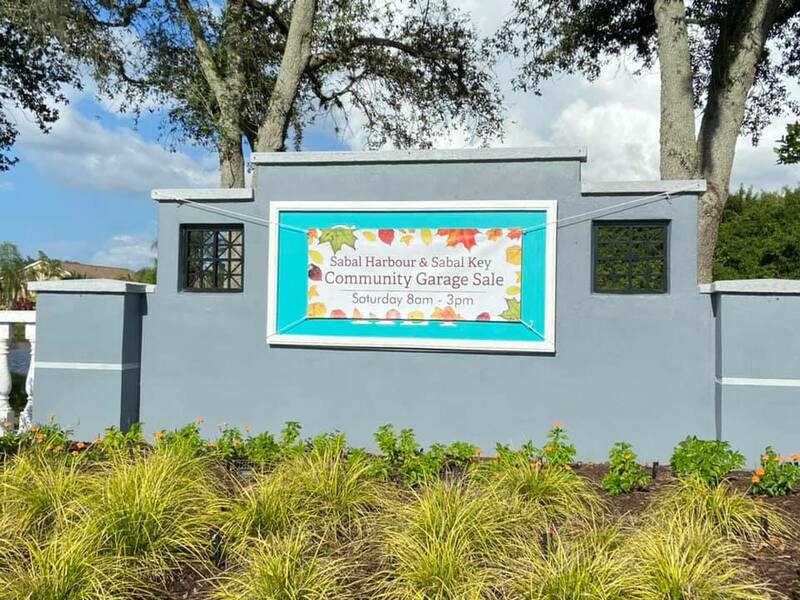 Please make sure that you all put the Community Garage Sale on 10/21 from 8am- 2:30 pm on your calendar. Sabal Key Gates will open at 7:45 am. The Board has placed advertisements for three days before the event in the Herald and will have signs starting to appear in front of our property including signs on SR 70. The SR 70 signs usually go out three days before the event. Make sure to tell your neighbors. Sabal Key residents. We are getting bids from 5 companies to power wash all sidewalks up to the front door plus curbing in Sabal Key. Also so for those residents in SK who back onto the most southern lake ... we are rethinking the erosion project with the company that started it. What you see is not the final job. Stay tuned. Jbnesbitt. ​Sad to report that the annuals that were planted at the entrance to Sabal Harbour did not get through the hurricane and had to be removed. For you Weed Watchers ... we will ask G &S to remove the weeds that at the end were growing better than the plants. Jbn. Starting in October our Property Manager C&S will be sending out letters to all homeowners who owe HOA fees. Please note that we will work with anyone who has questions on their HOA payments. If you believe that these numbers are not correct, before calling make sure that you have a copy of your payment in question. Very happy to say that two major projects will be finished this weekend. First the Entrance gate to Sabal Key is being painted for the first time in many years. The two damaged and missing parts of the gate are also going to be repaired. If it is not finished by this evening it will be finished next week. Also the 45th St Wall and the 44th Ave wall will be power washed this weekend. Your Board is focused on making both SK and SH a better looking place to live. October will bring two major events. First, Fining letters will be sent to homes that have received two violation letters. Second, for the first time in a very long time letters will be sent to the residents / owners who owe HOA fees. We recognize that there may have been payments made to the HOA that were not recorded. Once you receive a letter we will be very happy to work with you to make sure all of your payments are recorded. If money is due we will expect payment. If you have children who ride bikes in SH / SK please make sure to tell them that their bikes are not allowed in the Pool area. Our new Cameras are recording many kids with bikes at the pool. This is not allowed. Also know that the Common area closes at 8 PM. We are working to lock all gates at 8 PM but until we do please make sure that your family knows that they should not be in the common area including the pool after 8 PM. 12 PM Sunday - Not too much yet. We are getting bands of rain and wind as the storm still has several hours until the big blow will come. Winds have been gusting maybe to 30 MPH. We are now expecting 10+ inches of rain and the winds will be their highest ( 106 mph) maybe around 9 - 12 tonight. So far as of noon ..... not much that we cannot handle. It was great meeting so many people / families today as I drove around SH and SK to make sure that garbage cans were in the garage. Thank you to the many that were pleased with what the Board has done in the past four months ... more to come ... bunker down and be well. If the weather holds we will have a Board Meeting at 7 PM at the clubhouse ... Tuesday 9/12/17. Lots to discuss. All are invited. Pleased to say that the entrance to Sabal Key including the mail area was power washed today. Weather permitting Sabal Harbour tomorrow! Plus we are having two empty homes mowed tomorrow on Turtle Bay and Captiva in SH. Grass in the sandy part of the playground was killed last week and the area will be tilled when the playground dries out. Sand will be added if necessary. Are there any reports of homes in Sabal Harbour having flood damage from the storm. We have a resident in SH who had baseboard flooding and the Flood Insurance company said that it would be easier to process if there were other reports of houses that were damaged. This does NOT include roof leaks ... Please respond below with your name and address ... and what the damage was. I just got through a drive / walk through both SH and SK after the storm and am pleased to say that we got through it with little damage. I am starting to hear about a few roof leaks ,... and yes our house has a leak ... but the lakes are going down and the roads are wet but not flooded. If you live in SK and have a roof leak please let me know jnes1021@gmail.com Our repair of the land erosion in SK got hammered but our contractor will view it tomorrow. I did notice that one lake on Sabal Harbour Dr. does not have an overflow drain. It drains through the woods ... We will put this on our list of things to respond to. I am VERY PLEASED that today our contractor was able to fix the land erosion on Lake 17 in Sabal Key. For the residents on Misty Canal and Sabal Key Drive the land was eroding due to a very poor French drain install that was done 7 years ago. Shortly after I was elected as President of the Board Bill Leggett, VP and I along with Aaron Hochstetler were made aware of a major land erosion that was growing towards the seven townhouse clusters along lake #17. We met David Walsh who has a can do attitude and has started to work with us to get many projects done in both SK and SH. David had a plan and today the plan is in action. The Board approved a $ 6,500 proposal to FIX eight land erosion sights along the lake. David's first look showed that 7 years ago the wrong pipe was used to drain into the lake. Also there was no crushed rock to support the drains. David is working today to take care of what could have been a very serious erosion that would have affected so many homes. Its disheartening to announce the devastating house fire on Useppa Drive which recently occurred. The unfortunate tragedy has displaced this family indefinitely - A single mother and her parents, whom she was living with to help both of them with their disabilities as she works hard to support her two teenagers. Her dad and owner of the home is a Vietnam vet and also served 26 years as a Sarasota police officer. The fire was declared electrical due to a double power surge from one of our summer storms. As a caring community, your support will bring much relief to this family who is now split up and trying to recover from the emotional trauma. Of course insurance will cover certain expenses including a complete rebuild, but we know how slow that process that can be. However, it's the daily living necessities that they'll need immediately and for months to come such as food, clothing, toiletries, personal care items, bed & bath supplies, school supplies, pet supplies. This family is in need of our caring hearts, please donate a gift card of any denomination from a local store such as Publix, Walmart, Target, Bealls, Marshals, Kohls, Home Depot, Lowes, Pet smart/Petco, local restaurant or pizzeria. You can drop them at the office during working hours, in the mailbox outside the office or if you choose at the next board meeting on Sept 12th at 7:00pm. A greeting card will be at the office as well as the meeting if you choose to sign it. Whether or not you've donated, letting the family know you care and are wishing them well will certainly touch their hearts. I received an email this evening asking which fence was scheduled to come down with the road widening ... That fence is NOT on 45th Street. The fence is back by the Northern entrance to Sabal Harbour from the monument to the preserve. I will add a picture to this posting. After a meeting Friday with the engineer ... we MIGHT not even lose that fence. The lines are close but the engineer is going to get back to us. If we lose the fence we would be given some money to rebuild it. We are looking into their offer vs. real costs in the next few weeks. We know that we are going to lose trees on 45th but no fence. The SHHA Board needs your email address . Can you please send me your Name Address and email information so that we can send you timely info when the need arises. Send this info to me John Nesbitt at jnes1021@gmail.com I will pass it on to Shana Macri our Property Manager. If you notice the business card dumped on your driveway today ... I hope that you give this guy no business. As I was walking around the property I came across business cards for a power washing company that were just thrown on the driveway. This card times 482 homes will just end up in the lakes. Mistake last night at the Board Meeting ... Last night we stated that the Phase III Water ban had not been lifted. Actually it was but still not good for new plants. You can now water two days a week. See your days in the picture below. This does us no good for new plantings ... as if you have not planted on 50% of the irrigation zone you must hand water after the two days. Example ... if you resod part of your front lawn and it does not equal 50% of your irrigation zone you can water two days but must hand water the rest of the week. We will not have 50% of any zone and if we did with so many zones it would be irrigation chaos. Aaron is working with the irrigation people to get micro irrigation heads in the area of replanting so that we can water more frequently. Micro irrigation is permitted more frequently. ​Seeing that we have many more people looking at this page than ever before I want to know more information regarding the widening of 45th street ... especially if you live in a home facing 45th street. This project should start in the Fall months. We were made aware by FPL that we will be losing 36 Oak trees and several palms along 45th street. If there is a tree with a power line and pole in front of it ... it will be taken down. We have worked with FPL to make sure that they stump each tree at their cost. These oak trees will mostly be in front of Sabal Harbour but 6 - 8 trees will be taken from in front of Sabal Key. There is an area where the power lines go under the ground. NO TREES will be taken from here. Once we see what is happening our plans are to put some trees behind the fence to help reduce the noise. Losing the Oak trees is both good and bad. The Oak trees provide shade and noise protection ... but Oak trees as they get older will pull up the fence with their roots ... so all in all in the long run it will be better for us. Bill Leggett, VP SHHA BOD, and I traveled to meet with the land acquisition people who had sent us paperwork regarding the land that will be taken for the widening project. It seems that FPL and Manatee County do not agree on what is presented. FPL told us that regarding the 44th Ave project they would not have to move any poles. We learned from the County that at least one pole next to the back entrance (west side) would have to be moved. We also learned that they will be taking our boundary wall from the Western entrance to the preserve. This represents about 150 - 200 feet. They have offered us a sum of money for the land. We would certainly have to use this money to build a new fence. This project should start in between 2- 5 years. Please put the Monthly Board Meeting on your schedule this week. We will meet at 7 PM on this Wednesday 8/16. this Board has been working for the past four months at making SK and SH a better place to live. At this months meeting we will be discussing past and up coming work to be done in the property, the high definition camera system that has been approved for the common area. The Lake Committee and the Landscape Committee will make a presentation ... and we will talk about the 45th and 44th plans to widen the roads. We will talk about assisting the family that suffered their home loss due to fire. As of Monday the four cars in question that were parked in Sabal Key have been removed. 2 had improper registration, one car came in on a flatbed and one had no VIN and No license,. Your Board in action. ​LAND EROSION IN SABAL KEY. The SHHA Board has voted to fix the land erosion that is getting worse on Lake 17 behind Misty Canal and Sabal Key Dr. due to improper installation of the drains seven years ago. The company should start the project in two weeks. Your Board is working to improve Sabal Harbour and Sabal Key. - jbnesbitt. COMMON AREA CAMERAS APPROVED We have the votes from the Board for the high resolution cameras for the clubhouse, parking lot, gate entrances, play ground, pool and basketball courts. The system should be installed prior to September 1st. This Board is interested in improving Sabal Key and Sabal Harbour. -jbnesbitt. There is a Spectrum Cable person going door to door saying that he is approved by the Board to knock on doors. He even uses names of some Board members and also names others. He is NOT approved by the Board to knock on doors. Ask him to leave. Today thanks to a neighbor in SK I was made aware of four cars that were sitting in the SK parking area ... one had no license, two had expired tags and one was dropped off by a flat bed. One of the cars had a note on it and upon reading it it gave the name of a person and a telephone number. I called the number and told the person that this was not a used car parking lot and that he had until Wednesday to remove the cars. He said that he would . If I could have faced one of these punks today I might be in jail this afternoon. I went back to my house and got tools to gather most of the glass. I put a sign on the fence stating that broken glass was in the area. I am going back tomorrow morning early to make sure that I got all the glass. So here is what I did. I approved a proposal for $ 6,600 that will give us a better camera support throughout the common area. The Property Manager and the Board of Directors will be able to see the area off of our computers. We will be able to see faces and we will react through the Sherriff is needed. We will have a 6 TB computer that will be able to store information. The pool has been reopened as of Wednesday AM at 8 AM. The pool was shocked and cleaned. PLEASE ... parents with children in the pool with diapers ... PLEASE make sure that the diaper is TIGHT so that nothing floats out ... NOT FUNNY..
We now know where the 11 year old person is living that drives his motorbike around Sabal Harbour in and out of traffic around the property. A Sheriff was at his house this past weekend. I spoke with the adult at this house today and told her that I feared for both his safety and our safety as we drive around SH. He does not need a license due to the fact that the bike is 49cc. The Sheriff told him to stay on his street which is Cabbage Key Rd. If you see him riding around SH/SK please let me know immediately. ​C&S COMMUNITY MANAGEMENT TO BE OUR NEW PROPERTY MANAGER EFFECTIVE 7/1. WE ARE VERY EXCITED WITH THIS COMPANY AND WHAT WE CAN DO IN THE COMMUNITY. STAY TUNED! TREES IN THE BACK OF THE COMMON AREA ALONG THE FENCE WILL BE TRIMMED MONDAY 6/12. Please remember to pick up after yourself and your pet in the community. All pets must be on a leash on any public property, street, or sidewalk, or on private property of another. In accordance with the Manatee County Government - Animal Ordinance Outline. Rats have been sighted in Sabal Key, and also have invaded some of our buildings. Since they are attracted to pet feces and garbage, please pick up after your dog and deposit it in the dumpster, not behind the bushes or near your home. Also do NOT leave full trash bags on your stoop, but carry them to the dumpster. There has been a lot of illegal dumping in the Key dumpsters. We urge the residents noticing people from outside the community using the dumpsters to write down the license plate and make of the car and give that info to Ken or send an email through this website. We would like to start fining those who aren't using the dumpsters correctly and track down those using the dumpsters who don't live in the community. NOTE: If you notice a dumpster lid open, please close it...another preventive measure to keep pests out. Please make sure your mailbox is clean and that you have a working flag. Also repair any mailbox post damage you may have. Have you checked out our Facebook page? We are still looking for some people to work on the community newsletter. Anyone out there with editorial skills we would love to have you work on this project. Please contact our current President John Nesbitt if you are interested. Please make sure you clean-up for yourself to keep the area clean for all the residents. And remember to abide by all the Pool Rules. Please keep an eye out for yourself and your neighbors and remember to call the police if you notice any foul play. Make sure you secure your home, keeping your garage door closed even while home cuts down on easy access, as does locking your screen and slider doors to your lanai. Do not leave valuables in plain site, especially in cars parked in your driveway, parking spaces or in front of your home. Keeping your outside lights can be a good deterrent to keeping prowlers away. We want to keep Sabal Harbour and Sabal Key safe communities, we do have the police patrolling often, but do not hesitate to call them for any reason. For those you that live in Sabal Key here is the insurance document that you need for you mortgage company. Don't forget that our Community Clubhouse is available to rent for parties/gatherings. For more information on fees and availability, swing by the office on Tuesday 8:30 - 12:30, Thursday 12:00- 4:00 or Friday 12:30 - 4:30 and see either Shana or Jessica. You can also click here to make an inquiry about renting the clubhouse.